Dryer. WiFi included in rental. Movies outside on the lawn. 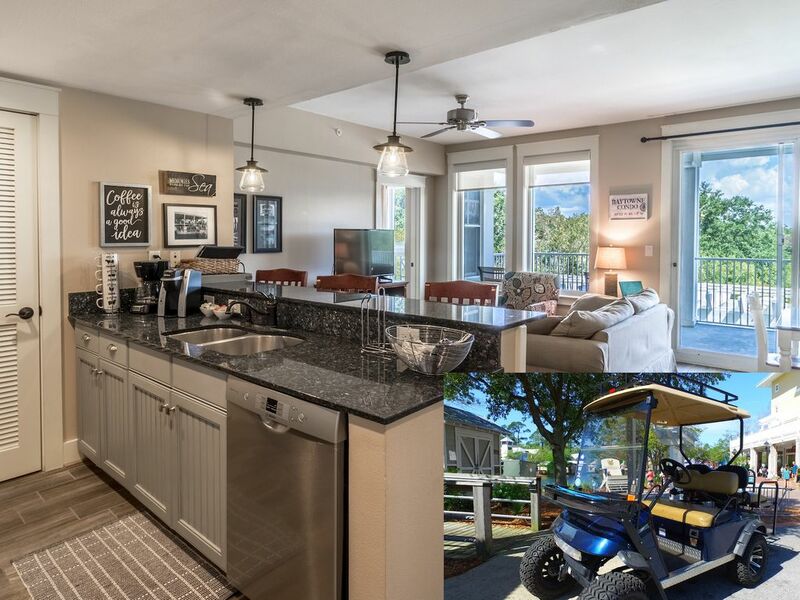 Keywords: Condo, Sandestin, Village of Baytowne, Wharf, Baytowne Wharf, Baytowne Condo, Village of Baytowne Wharf, Destin, 30A, Golf Cart. I purchased this property in 2005 and have self managed the unit via VRBO and other sources since 2008. I strive to provide world class service, fast responses times and to ensure your arrival, stay, and departure are that of what would be expected of a top notch hotel. Providing this service has led to Premier Partner status with VRBO along with a multitude of repeat guests each year. Whether for a couples getaway/anniversary or a fun filled family vacation this unit is perfect for either. You are only steps away from the events plaza and all the activities the Village of Baytowne Wharf has to offer. The unit has both reserved outdoor parking & reserved parking in the downstairs parking garage. You're also a short walk to the Marina Bar & Grill where you can enjoy cocktails and the sunset to end your day! Secured, covered, gated access parking in garage. Reserved outdoor parking as well. Fitness equipment replaced in Spring 2014. Fitness center is next to pool. Fully stocked kitchen with pots, pan, extra utensils & various seasonings. Living Area has 43' flat screen TV, Bunk Room has 26' flat screen tv & master has 32' flat screen tv. Tennis courts a quick walk from condo. Contact the resort about reserving court times. I can’t say enough about our stay at Baytowne Condo. It was perfect! It had all the amenities you could possibly need, the location was amazing...so close to everything and I fell in love with the master bed it was so comfy. I can’t wait to stay here again. I have stayed at other properties in Sandestin and will never stay anywhere else again. Renting the golf cart is a MUST. I was a little questionable as to wether or not we needed it, and it was a no-brainer. We LOVED having the golf cart and I wouldn’t go without getting one ever again! My kids said that was their favorite part! Thanks for all your communication Dave, you are awesome!!! Can’t wait to stay with you again! This condo is nicely appointed and furnished. It was just me and my husband and it was spacious enough for us. We loved having the golf cart to get around the Sandestin area and to visit the Farmer's Market on Grand Boulevard and Publix to pick up a few grocery items. There is no noise, the condo is well insulated. We usually stay at the Marriott Residence Inn on Grand Boulevard, but we will stay here from now on---we like to visit a bit off season to avoid traffic. Baytowne Village is nice to walk around and plenty of restaurants if you don't want to go offsite. We will definitely be back soon. This condo is absolutely amazing! We needed a short getaway for a girls trip, definitely ended up at the right place. Quick access to everything you need, as you walk out onto the property. I will definitely stay here again. Thank you Dave for being sweet and helpful throughout our whole stay! The space was perfect for our stay! Clean, loved the location, kitchen had everything we needed! We traveled to Sandestin November 3-10, 2018. We loved that it was much less crowded this time of the year. Check in was a breeze if you follow the owners instructions. The condo was clean, tastefully decorated, and we loved the location of it. We added the golf cart for the week so we were a short drive to the beach or shopping. We also loved that we were right there at Baytowne Wharf!! Temperatures were 75-80 degrees during our stay. We enjoyed walks around Sandestin, bike rides, golf cart rides, playing at the beach, and outdoor dining. My family travels to this area fairly often, but this was the first time to rent this condo and it won’t be our last!! Dave was very easy to communicate with if any questions came up! We had an excellent stay in Dave’s Baytowne Condo. We were so close to everything in the Wharf and only had a short ride to the beach. I definitely recommend renting the golf cart from Dave too! It was affordable and our kids (7/3) loved riding around on it. In addition to the benefits above, the condo was very clean, quite (even during Brewfest) and stocked with everything we needed for our stay. Lastly, Dave is the absolute best owner I’ve ever rented a condo from. He was so accommodating from the first time we spoke until we checked out and were traveling home. How many owners wish their guests safe travels home?! Thanks, Dave. Beyond that Dave checked on us everyday throughout Hurricane Michael and made sure we were well informed prior to and during our stay. Thank you, again! We’ll definitely be back! Beautiful condo located in the heart of Baytowne Wharf. Everything at your fingertips! What a lovely condo right in the heart of Baytowne Wharf. Great location for couples or a family. My children, ages 5 and 3, were never bored. I highly recommend renting the owner’s cart while you stay. It’s practically free compared to how much it would cost to rent elsewhere. The cart ride to the beach is beautiful, and my children loved going through the tunnel. You park the cart right next to the boardwalk. So cool. First day was a beach day, and we wrapped the night up with the kids running around the perfect playground. Second night we did the pool and headed over to the arcade area. We ate dinner on the bay at Poppy’s/Hammerheads. Everything is walking distance from the condo. Shops, restaurants, fishing.. They had really neat activities planned in the Wharf each night. Live music, Talk like a Pirate show for the kids. If you don’t want to deal with the hustle and bustle of Destin yet want to stay entertained, this is where you need to stay. We stayed 5 days and only drove our car once into Destin. We will definitely be back next year. The greatest part was the open communication with the owner. We didn’t have to deal with a management company or pay those outrageous management fees. He always made sure we were taken care of. Thank you for the memories Dave! !